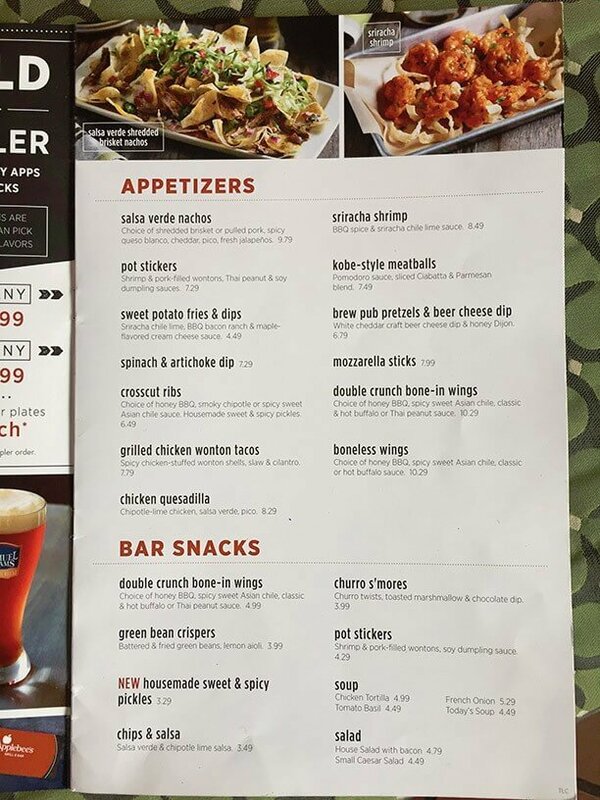 We have the full menu with up to date prices for Applebee’s Neighborhood Grill & Bar®. 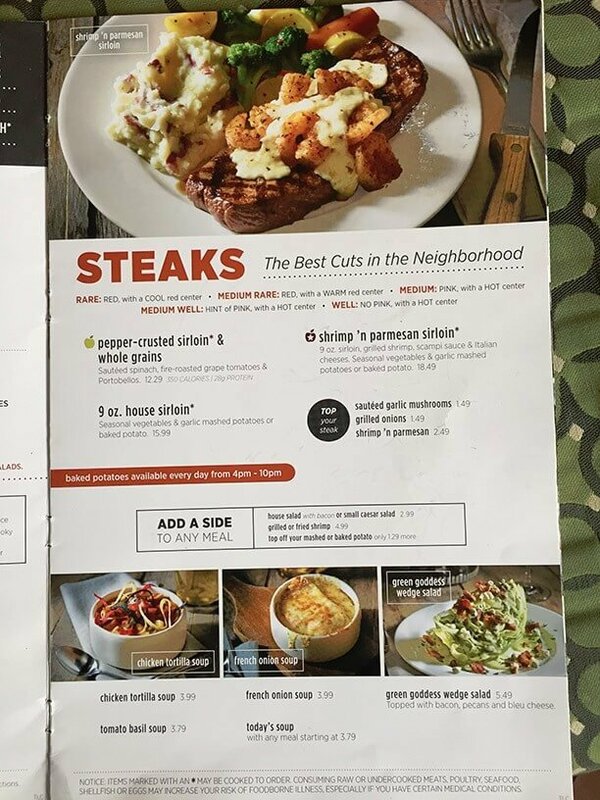 Applebee’s is a favorite meeting place and family dinner destination. 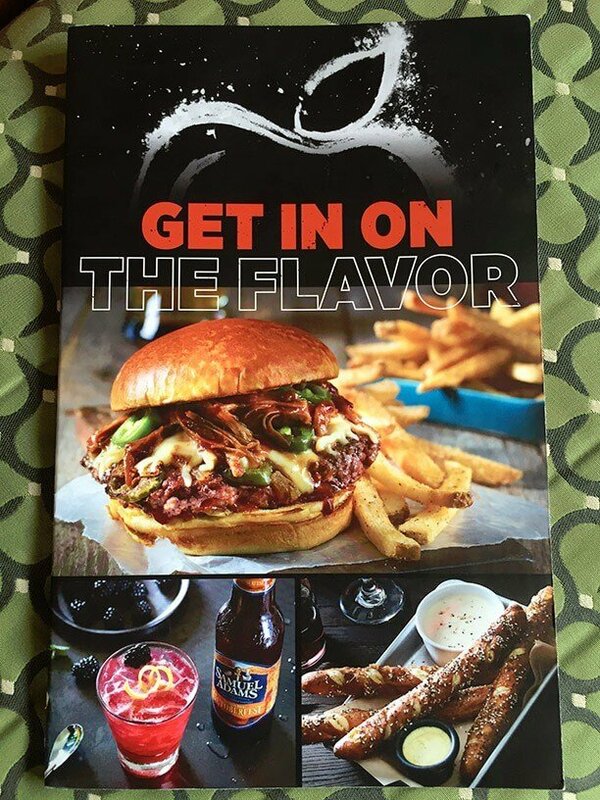 Applebee’s serves classic American fare as well as dishes inspired by global flavors in a casual dining atmosphere. 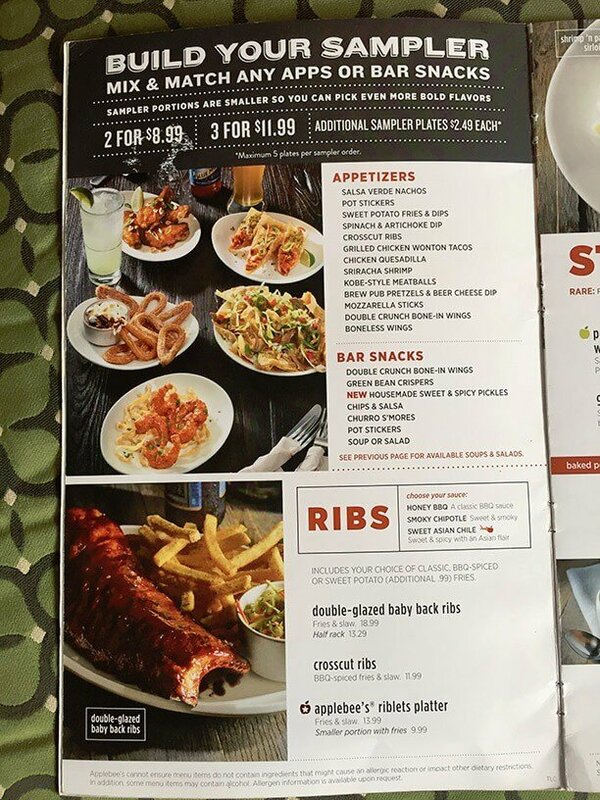 Alongside an extensive menu featuring steaks, ribs and seafood, there are budget friendly combination platters like the 2 for $20 option that includes two entrées and an appetizer to share. 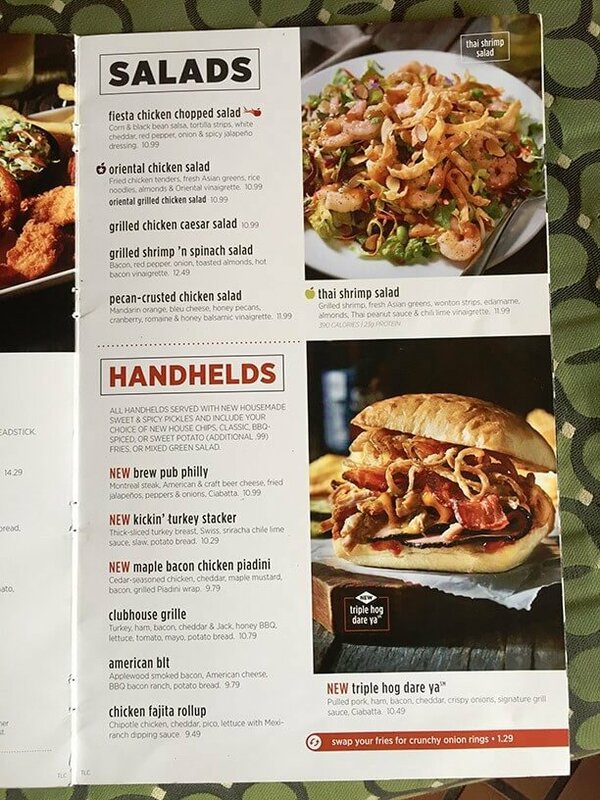 Longtime supporter of helping people eat well while eating out, Applebee’s also has lots of lighter menu options and half portion choices. Dessert Shooters also add to the experience if you are counting calories since you won’t have to skip dessert. Mix and match any apps or bar snacks. Sampler portions are smaller so you can pick even more bold flavors. To make our sizzling entrées taste their best, they are served to you on a very hot skillet, so handle with care. You can have it all with wholesome ingredients and satisfying portions. All handhelds served with new housemade Sweet and Spicy Pickles, and include your choice of new house chips, class BBQ-Spiced, or Sweet Potato (additional .99) fries, or mixed green salad. Mushroom Swiss Seared in: Portobello and button mushrooms, Piled on: Swiss, BBQ bacon ranch. Notice: Items marked with an * may be cooked to order. Consuming raw or undercooked meat, poultry, seafood, shellfish or eggs may increase your risk of foodborne illness, especially if you have certain medical conditions. No Substitution. Price does not include beverage, dessert, tax or gratuity. Server with shaker tin for multiple pours. Malibu Red Tropical 'Rita Malibu- red, a fusion of Caribbean rum and Mexican tequila, DE Kuyper- Peachtree schnapps, mango. Strawberry Lime Margarita Sauza Blue*, grand marnier, strawberry. Blue Agave 'Rita Sauza Blue*, signature margarita mix, salted rim, Also available frozen. New Bourbon & Berries Makers' Mark, blackberry, cranberry juice, lemon. New Ruby Red Lit Tito's Handmade Vodka, BACARDI, Tanqueray, triple sec, grapefruit, sweet & sour. 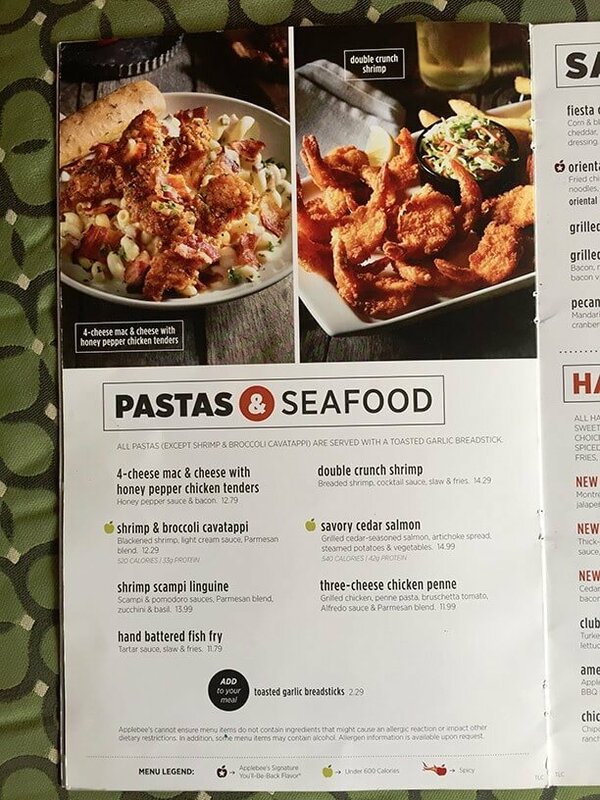 You will want to start with one of Applebee’s many appetizer choices offering tastes from around the world like Pot Stickers with an Asian flare or Sriracha Shrimp with chile lime sauce for a Southwestern kick. Can’t decide? That’s okay. 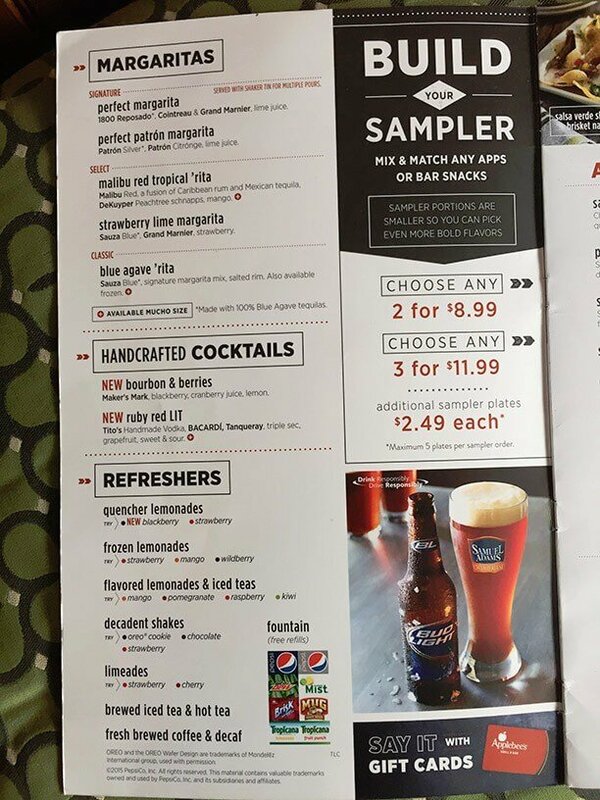 Applebee’s has you covered with the Build Your Sampler combo of any two (or more!) app selections. The Have it All and salads sections of the menu highlight lighter choices that still pile on the flavor. If you are looking for something for a hearty appetite, consider one of the All-In Burgers that come with endless servings of fries or House Chips. Entrees cover all the bases from steak and ribs to pasta, chicken and seafood favorites. 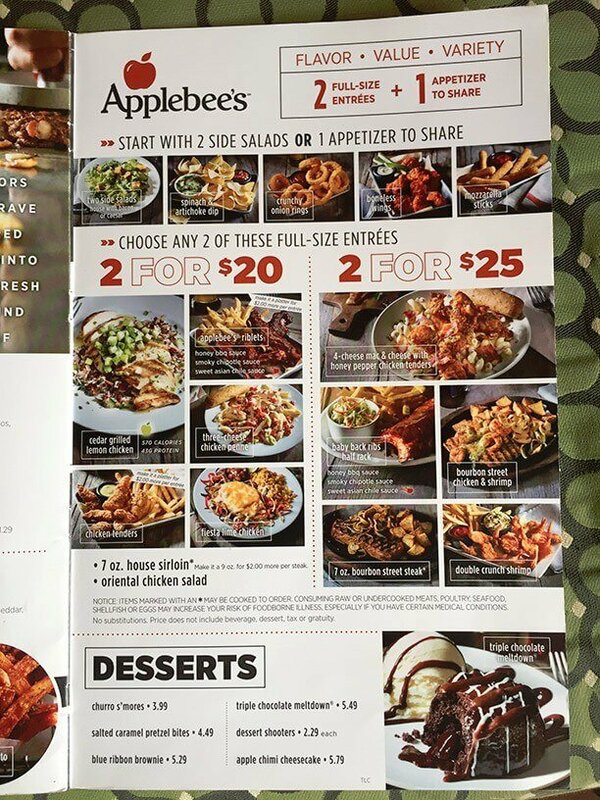 With a strong menu for the kids and a 2 for $20 budget friendly menu, Applebee’s is a great family stop. With a full range of decadent desserts and adult beverages, adults won’t feel left out either. Bold in flavor, short on calories, this Asian inspired salad will leave you feeling satisfied and guilt free. Chile lime vinaigrette dressing, crunchy wonton strips, fresh cilantro and smooth peanut sauce top a mix of greens for $9.99. Smoked with Applewood until tender and smothered in your choice of three BBQ sauces: Honey BBQ, Smoky Chipotle or Sweet Asian Chile. Served with slaw and fries for $12.99. You won’t have much room for dessert so Applebee’s offers Dessert Shooters for just a taste of sweet at the end of your meal without adding much to the tab at $2.29. Hot Fudge Sundae, Chocolate Mousse and Strawberry Cheesecake offer plenty of variety to choose from. In 1980 founders Bill and T.J. Palmer opened T.J. Applebee’s Rx for Edibles & Elixirs in Atlanta, Georgia. The restaurant was a popular meeting place for locals and was sold to W. R. Grace and Company in 1983. In 1986 the first franchise of the restaurant opened in Kansas City, Missouri and the name of the restaurant became the now familiar Applebee’s Neighborhood Grill & Bar. After being sold to Abe Gustin and John Hamra in 1988, the company went public as Applebee’s International, Inc. in 1989. The 1990’s were a period of international expansion as well as corporate mergers, and by 1999 sales topped $2 billion and 1,168 Applebee’s restaurants spanned the globe. 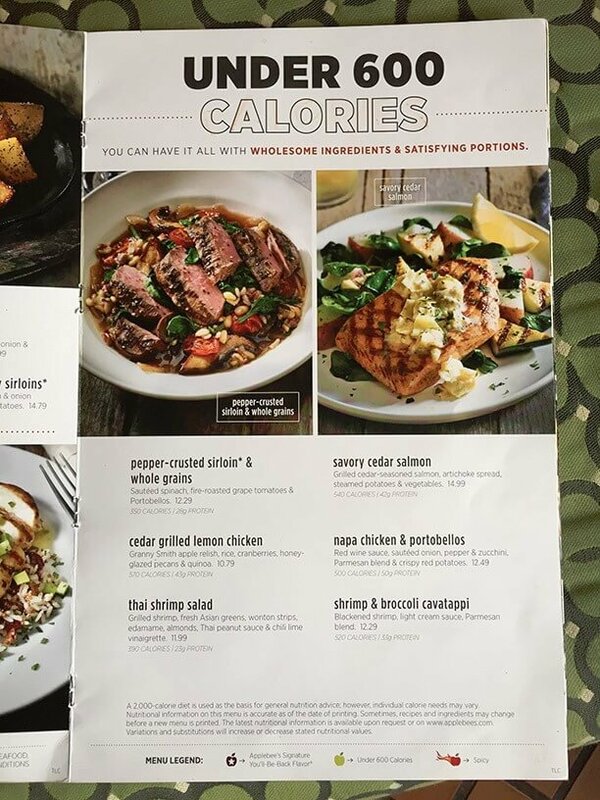 In 2004 Applebee’s partnered with Weight Watchers, adding a new section to the menu specifically designed with members in mind. 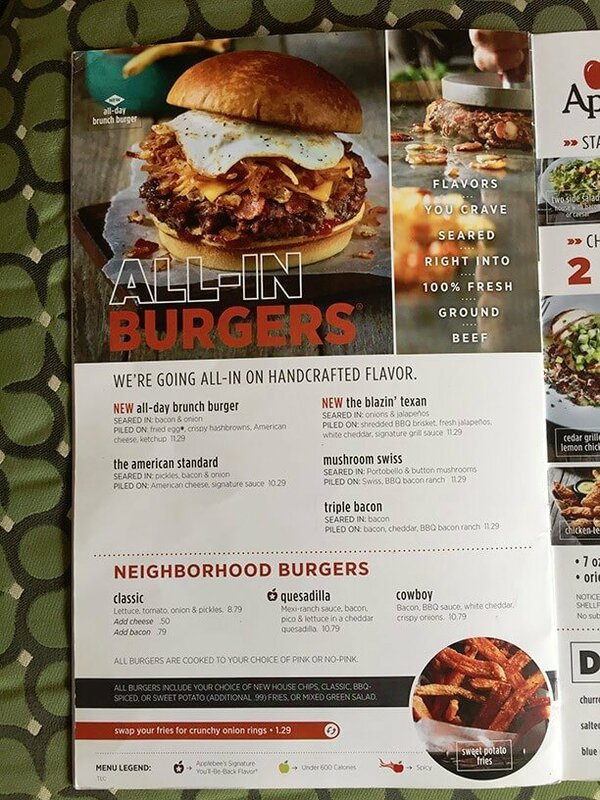 In 2009 Applebee’s launched the ad campaign: “There’s no place like the neighborhood.” By 2013, Applebee’s had over 2000 locations worldwide. 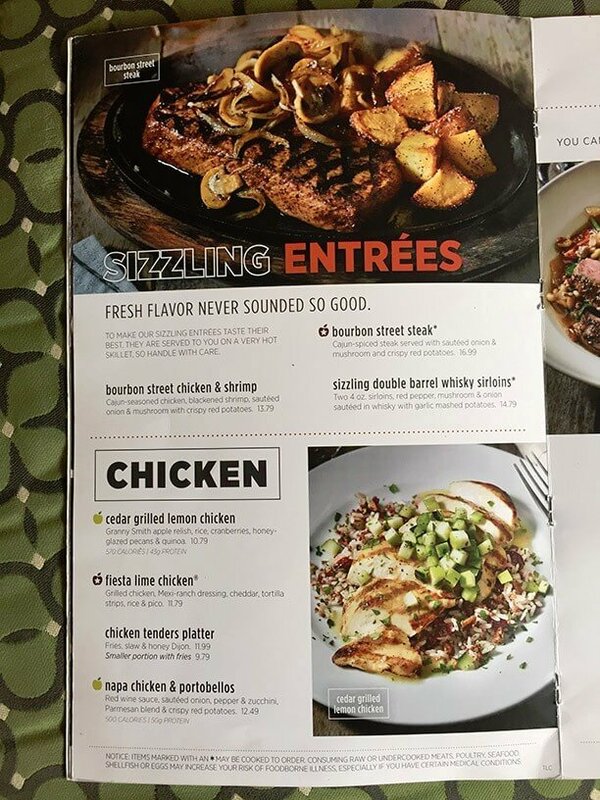 Applebee's menu prices are subject to change without prior notice. Prices shown in images & the following table should be seen as estimates, and you should always check with your restaurant before ordering. 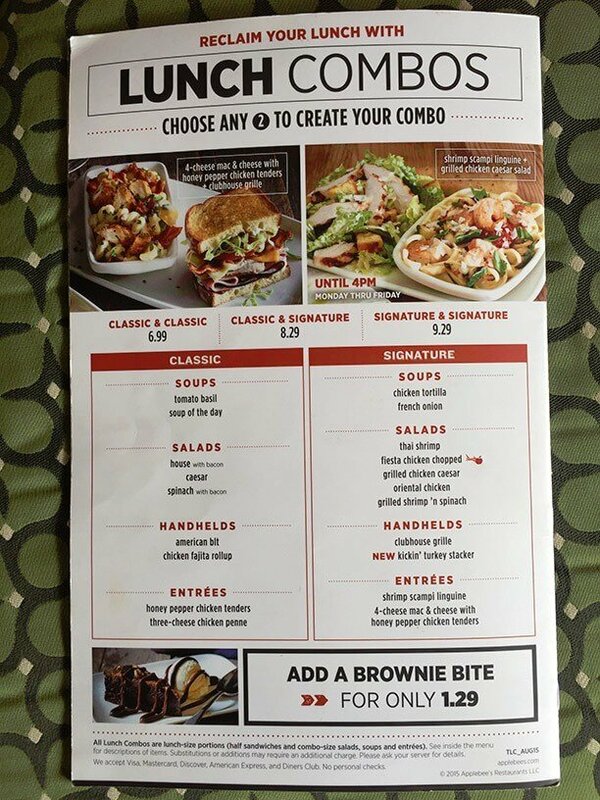 Applebee's menu images sourced via e-mail from restaurant customer & menu-price.net user. menu-price.net does not guarantee the pricing or availability of any menu items listed in image or table format on this page. Pricing may vary from location to location.